NK Architects, working with Populous, renovated and expanded Stony Brook University’s arena into a first class Division 1A multi-purpose facility for both the men’s and women’s Seawolves basketball teams. The new state-of-the-art 40,000 square foot Island Federal Credit Union Arena now provides the ultimate fan experience to more than 4,000 spectators. The creation of a “bowl” type arena with improved seating and sight lines, as well as the addition of new video scoreboards and a high-tech sound system, ensures there’s not a bad seat in the house. 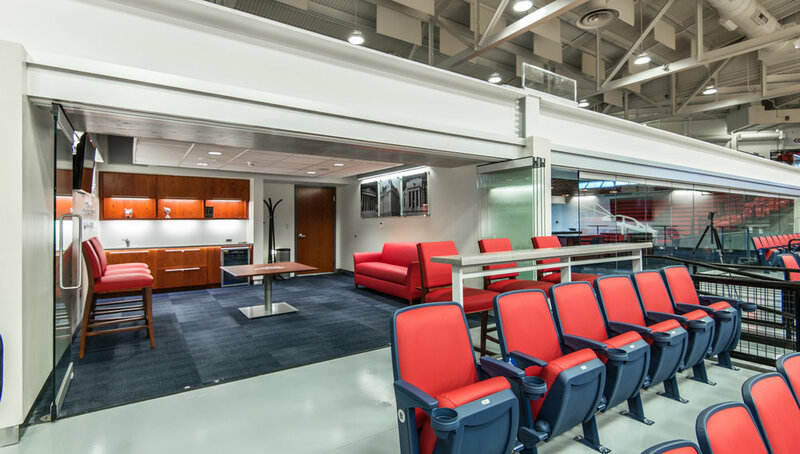 In addition to the regular “bowl seating,” the arena was carefully planned to include exclusive amenities for the Seawolves’ VIP supporters. New permanent VIP loge boxes with retractable courtside seating have been provided to put fans closer to the action, creating a significant home court advantage. The loge seating areas are accessed from four luxury suites, each accommodating 12 to 16 people and a 123-person VIP lounge offering upscale buffet dining, large flat-screen HDTV’s, private restrooms and more. The arena showcases these unique new amenities through a transparent crystalline lantern entry directly adjacent to the newly configured parking lot and the ESPN mobile television production truck platform. Other additions include wider concourses and improved concession areas, a video/television production center, a “green room” for concerts and postgame media interviews, a new “Hall of Fame” and athletics store, an improved box office, team store and main entry lobby, as well as upgrades and replacement of all heating, ventilation and life safety systems. The flexible design of the arena makes it possible to accommodate various other sports, concerts and a variety of special events, both for Stony Brook University and other outside users, making it once again the premier destination for sporting events in the area.